So the last real contender for me as an optional list for Dundracon would be to take a Ravenwing list. I think for 1500 points you just sell out on getting bolters in there with the banner of Devastation. I like Black Knights and Darkshrouds but I think they have to go at 1500. So let's go back and compare that to the normal bike list I mentioned last week. Sammael and the Captain both have some give and take, neither are slouches. The Dark Angel Libby is arguably better with Divination, until you run into Daemons and you are happy your SM Libby has Nullzone. So let's look at the troops. The marines have 5 x 5 bikes, or essentially 30 wounds in the troops section. The Ravenwing have 4 x6, plus 3 x1 Attack bikes. So 7 scoring units, or possibly up to 11 if you want to go crazy. But it is still 30 wounds. If we look at TEQ and Tank busting we'll see it comes pretty close. Ravenwing have 6 Plasma guns, 3 Combi Plasma, 3 Plasma Talon (assuming you don't trade one for a Grenade Launcher), 2 meltas, 1 combi melta, and 3 MM. Let's say at 24" that is 12 great shots possible and at 12" that is 27 shots. That goes to 30 at 9". Oh and I guess there is Sammy's Plasma Cannon as well! For the marines you have 10 Plasma shots, 5 Combi Plasma, 5 MM, plus the Storm Talon has twin linked Assualt cannons and the Lascannon. So at 24" that is 25 High Str shots, and at 12" that is 40 shots. Even if you take the Storm Talon out of the equation turn one the High Str/Low AP guns favor the regular Marines. But let's go back to the bolters and what the Banner of Devastation brings to the table. First let's look at the regular marines. If I'm just firing all my bolters at enemy infantry I'm bringing 27 bolters to bare on the enemy. That's 27 shots at 24" and 54 shots at 12". This number sounds pretty great. The Ravenwing however have 28 bolters, only one more in reality from the Space Marines. However with careful placement the Banner of Devastation can turn those bolters all in to Salvo 4, making that 112 bolter shots at 24". Don't forget all these bolter shots are twin linked as well. Now there are some big caveats to this. Obviously this takes a lot of 'what is the max firepower' without giving much thought to how feasible that really is. I did not find it too hard to keep the bikes centrally around the banner in my WHOLE ONE TEST GAME. So that might be different in other games, I'm hoping to find out soon. Also that firepower goes down pretty quick with some key losses. Losing the banner hurts, and the attack bikes are really easy kill points that probably aren't really targetting infantry units anyway. So it sounds great to have all those bolter shots. They will chew through infantry. You can get through terminators and T6 at range with that many bolter shots. But you still aren't busting tanks as well. Also I am not sure I've lost many games against infantry based lists with my bikes that keep me up at night. Well Tzeentch Daemons, they keep me up at night. Does the banner and shooting firepower bring enough over Null Zone? Of course hit and run and scout are another pair of great adds to this army, and the ability to break up into lots of small combat squads is pretty great if you end up playing a many objective game against a slower low unit count army (like CSM usually). You lose Combat Tactics which is a shame. I think the vanilla marines has a better time downing fliers (between the higher amount of High Str shots and Storm Talon). Of course I think the trick for Ravenwing is knowing when to tactically get into combat and hit and run. Hit and run is more reliable than combat tactics, though I've used Combat Tactics to similar effect as well. 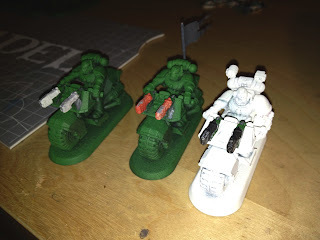 As for painting I would need to paint 4 more bikes, the 3 command squad guys (which I've converted, yay a use for plasma pistols), and Sammael. Not an impossible task in two weeks (no more so than two helldrakes and an HQ for Chaos). The biggest problem is I don't have a Sammael, and I'm told he is pretty hard to get a hold of right now. So I've got to decide pretty quick here on what I am going to do. The Marines bikers are done. The Chaos I have everything, and the desire to paint, but it has not be given any play time to test. 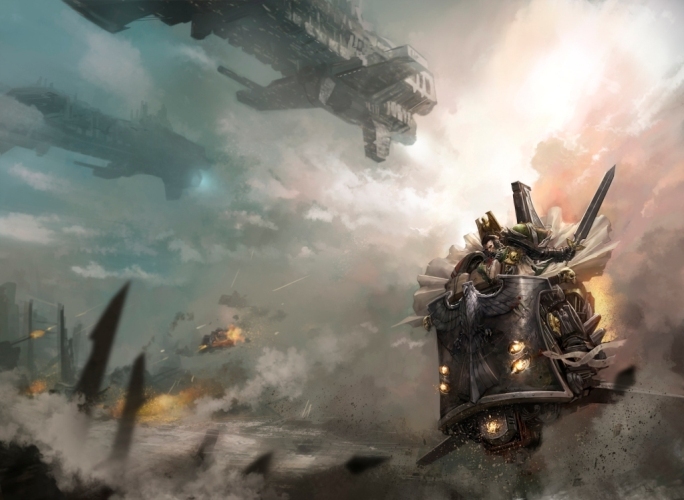 The Ravenwing seem neat but are also largely untested, have the most models to probably paint, and am missing the lynchpin HQ choice! I also have BAO looming in the background so I am trying to bare in mind what 1750 list I want to take to it and if that means I should get cracking on something now as well. At this point I think bikes are the answer, and I should probably just get cracking on more bikes being painted to give me options for more troops in either bike lists I'd be looking to run. Then maybe I target working on the chaos army for something like Kublacon in May which usually has a big soft score aspect.